Obama’s misstep – Israel’s ’67 borders would cripple defense and peace – Why suggest it then? I believe that Obama’s goal is the Muslim goal primarily. He is a Communist secondarily. He’s an anti Colonialist, as defined by the African definition. If one is anti – colonialist, then one is against the West and ALL that the WEST represents. This, indeed, means anti – Jewish and Christian, anti- Capitalist and anti – Socialist, this further means anti – Capitalist. This leave Theocracy and nothing else. THIS is OBAMA. This also means that a Caliphate across the ME, would not be objectionable to him. He is after all a TRUE son to Africa, not America. Regardless of his birth place, he is African. He’s SAID so. What did the president wish to accomplish by purposely starting an ugly fight with the prime minister this past weekend? http://www.JewishWorldReview.com | As the Washington Post pointed out on Friday, US President Barack Obama purposely provoked the current fight with Prime Minister Binyamin Netanyahu. He knew full well that Netanyahu does not back the Palestinian formulation that negotiations with Israel must be based on the indefensible 1949 armistice lines, or what are wrongly referred to as the 1967 lines. In the days leading up to Obama’s speech last Thursday, Israel registered explicit, repeated requests that he not adopt the Palestinian position that negotiations should be based on those lines. And so it was a stinging rebuke when Obama declared Thursday: “The borders of Israel and Palestine should be based on the 1967 lines with mutually agreed swaps.” According to the Washington Post, Obama wrote these lines of his speech himself and Netanyahu was informed of them just as he was scheduled to fly to the US on Thursday evening. Obama gave the speech while Netanyahu was in the air on his way to Washington to meet Obama the next morning. It is hard to think of a more stunning insult or a greater display of contempt for the leader of a US ally and fellow democracy than Obama’s actions last week. And it is obvious that Netanyahu had no choice but to react forcefully to Obama’s provocation. The question is why would Obama act as he did? What did he wish to accomplish by purposely starting such an ugly fight with Netanyahu? Probably the best way to figure out what Obama wished to accomplish is to consider what he did accomplish, because the two are undoubtedly related. ON MAY 4, two weeks before Obama gave his speech, Fatah and Hamas signed a unity agreement. Hamas is the Palestinian branch of the Muslim Brotherhood. Like its fellow Brotherhood satellite al-Qaida, Hamas shares the Brotherhood’s ideology of global jihad, the destruction of Western civilization and the establishment of a global caliphate. Also like al-Qaida, it is a terrorist organization which, since its establishment in 1987 has murdered more than a thousand Israelis. In 2005, Hamas subcontracted itself out to the Iranian regime. Since then, its men have been trained by the Iranian Revolutionary Guard Corps and by Hezbollah. Hamas maintains operational ties with both outfits and receives most of its weapons and significant funding from Iran. The agreement between Fatah and Hamas makes Hamas a partner in the leadership of the Palestinian Authority. It also paves the way for Hamas to win the planned Palestinian legislative and presidential elections that are scheduled for September just after the UN General Assembly is scheduled to endorse Palestinian statehood. It also sets the conditions for Hamas to integrate its forces and eventually take over the UStrained Palestinian army in Judea and Samaria and to join the PLO. The Hamas-Fatah unity deal constitutes a complete repudiation of the assumptions informing Obama’s policies towards the Palestinians and Israel. Obama perceives the conflict as a direct consequence of two things: prior US administrations’ refusal to “put light” between the US and Israel, and Israel’s unwillingness to surrender all of the territory it took during the course of the 1967 Six Day War. The Hamas-Fatah unity deal is indisputable proof that contrary to what Obama believes, the conflict has nothing to do with previous administrations’ support for Israel or with Israel’s size. It is instead entirely the consequence of the Palestinians’ rejection of Israel’s right to exist and their commitment to bringing about Israel’s destruction. Forcing Israel into indefensible boundaries, (which as Netanyahu explained to Obama at the White House on Friday, “were not the boundaries of peace, they were the boundaries of repeated wars because the attack on Israel was so attractive for them,”), will not advance the cause of peace. It will advance the Palestinians’ goal of destroying Israel. Obama had two options for contending with the Palestinian unity deal. He could pay attention to it or he could create a distraction in order to ignore it. If he paid attention to it, he would have been forced to disavow his policy of blaming his predecessors in the White House and Israel for the absence of peace. By creating a distraction he would be able to change the subject in a manner that would enable him to maintain those policies. And so he picked a fight with Netanyahu. And by picking the fight, he created a distraction that has, in fact, changed the subject and enabled Obama to maintain his policies that have been wholly repudiated by the reality of the Palestinian unity deal. By inserting the citation of the 1949 armistice lines into his speech, Obama made Israel’s size again the issue. The Hamas-Fatah unity deal actually demonstrates that not only is Israel’s size not the cause of the conflict, it is the main reason that Israelis and Palestinians live in relative peace. Israel’s control over Judea and Samaria and east Jerusalem, and with them, its ability to ward off invasion and attacks on its major cities is what has prevented wars. If Israel were more vulnerable, the de facto Palestinian terror state would not be weighing whether or not to begin a new terror war as its leaders from Fatah and Hamas are doing today. It would be waging a continuous campaign of terror whose clear aim is Israel’s destruction for again, as Netanyahu said the 1949 armistice lines make war an attractive option for Israel’s enemies. BY PICKING a fight with Netanyahu, since Thursday, no one could have possibly noted this basic truth because the false issue of Israel’s control over these areas — that is, Israel’s size — has dominated the global discourse on the Middle East. Obama would never have been able to create his diversion from the unwelcome fact of Palestinian duplicity and rejectionism, to imaginary problem with the size of Israel without the enthusiastic support given to him by the Israeli Left. Led by opposition leader Tzipi Livni, the Israeli Left responded to Obama’s full-scale assault on Israel’s legitimacy by launching a full-scale partisan assault on Netanyahu. Rather than back Netanyahu as he fights for the country’s future, Livni called for him to resign and said that he was wrecking Israel’s ties with the US. In so doing, the Left provided crucial support for Obama’s move to maintain his phony anti- Israel paradigm for Middle East policymaking in the face of the Palestinian unity deal’s repudiation of that model. The Left’s assault on Netanyahu is not the only way it has enabled Obama to maintain his pro-Palestinian policies in the face of the Palestinians’ embrace of terror and war. In his speech to AIPAC, Obama argued that Israel needs to surrender its defensible boundaries because the Palestinians are about to demographically challenge Israel’s Jewish majority. The demographic time bomb story is a Palestinian fabrication. In 1997, the Palestinian Central Bureau of Statistics published a falsified Palestinian census that inflated Palestinian population data by 50 percent. The Israeli Left adopted this fake report as its own when Palestinian terrorism and political warfare convinced the majority of Israelis that it was unwise to give them any more land and that the peace process was a lie. Since 2004, repeated, in-depth studies of Jewish and Arab birthrates and immigration/ emigration statistics west of the Jordan River undertaken by independent researchers have shown that the demographic time bomb is a dud. In January, the respected demographer Yaakov Faitelson published a study for the Institute of Zionist Strategies in which he definitively put to rest the tale of pending Jewish demographic doom. As Faitelson demonstrated, Jewish and Arab birthrates are already converging west of the Jordan River at around three children per woman. And whereas the fertility rates of Israeli Arabs, Gazans and residents of Judea and Samaria are all trending downward, Jewish fertility is consistently rising. Moreover, whereas the Arabs are experiencing consistently negative net immigration rates, Jewish net immigration rates are positive and high. Faitelson based his multiyear projections on current population numbers in which Jews comprise 58.6 percent of the population west of the Jordan River and Muslims constitute 38.7% of the overall population. Non-Jewish, non-Muslim minorities comprise the other 2.7%. Using assessment baselines for Jewish net immigration well below current averages, Faitelson showed that in the years to come, not only will Jews not lose our demographic majority. We will increase it. Faitelson’s study, like the studies published since 2004 by the American-Israeli Demographic Research Group show that from a demographic perspective, Israel is in the same situation as many Western states today. Namely, it has to develop policies for dealing with an irredentist minority population. There are many reasonable, liberal policies that Israel can adopt. These include applying the liberal Israeli legal code to Judea and Samaria and enforcing the laws of treason. It is hard to see why the best policy for Israel is to take some of that irredentist population off its books by establishing a terror state ruled by what Netanyahu rightly referred to as “the Israeli equivalent of al-Qaida” on its border. ALL OF this brings us back to Hamas, terrorism, the Palestinian rejection of Israel’s right to exist, and Obama’s diversionary moves to facilitate his preservation of a Middle East policy based on a wholly false and discredited assessment of reality and the Israeli Left’s facilitation of Obama’s efforts. When we realize what Obama is up to, we recognize as well what Netanyahu must do in response. In his address before Congress on today and in all of his appearances in the coming weeks and months, Netanyahu should have one goal: to bring the focus of debate back where it belongs — on the Palestinians. At every opportunity, Netanyahu needs to pound the message that the Palestinians’ commitment to Israel’s destruction is the sole reason that there is no peace. As for the Israeli Left, it is high time that Netanyahu place the likes of Livni on the defensive. This involves two things. First, Netanyahu must attack the Left’s doomsday demographic projections that are without factual basis and are indeed antithetical to reality. As long as the demographic lie goes unchallenged by Netanyahu, the Left will continue to argue that by refusing to build a terror state on the outskirts of Tel Aviv, Netanyahu is endangering Israel. Netanyahu deserves a lot of credit for standing up to Obama on Friday. He showed enormous courage in doing so. It was his finest hour to date and polls over the weekend show that the public appreciates and supports him for it. He must build on that success by putting the focus on the truth. Please, read below and think for yourself. This is the question asked most frequently by both the whites and the blacks. The answers to this question I shall state as simply as possible. Here are just two examples, but this is TRUE at EVERY Nation of Islam chapter. The Nation of Islam is a POLITICAL group that seeks it’s OWN nation. They are not in anyway inclusive. There is no such thing as EQUAL but separate, not to them. These are the people that your President that YOU elected cavorts with and calls his CLOSEST friends and colleagues. Landrieu Dance (featuring James O’Keefe) – Investigative Journalist / dancer? This is an awesome videoMade me get up and dance! The main stream media is not investigating. The reason is because the government is covering this up. Wow! Is this soviet Russia? Are we really living in a free country? 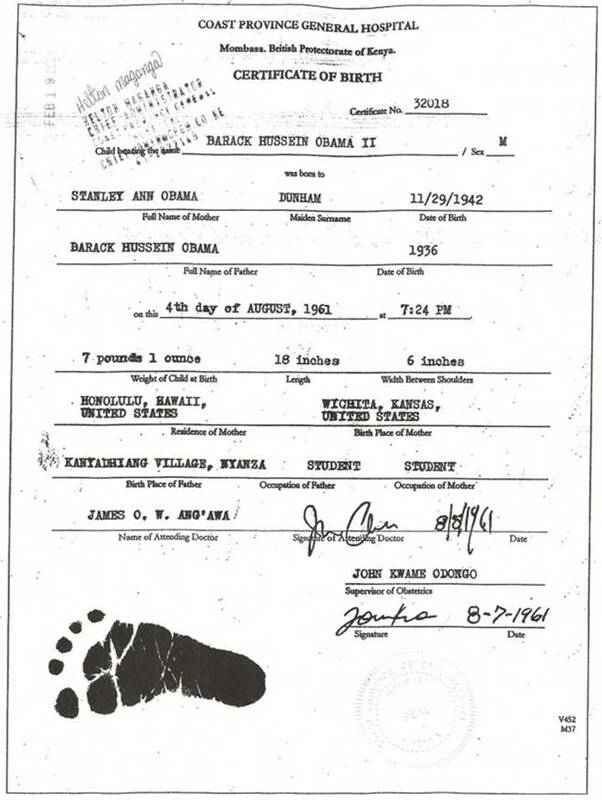 Obama should not be President – Birth Certificate from Kenya – Congress should investigate – this may be the PROOF – Where are the experts? Can anyone verify this? Kenya – Obama violates federal law and sends YOUR (US) tax payer dollars ($23 million and counting), while in a major recession, to SUPPORT abortion in Kenya’s new Constitution. Met within the time constraints. The discussion trend allowed me to ask Mr. Trump right after he was speaking about the Kenyan grandmother, whether he knew about the Kenyan Assemblyman, (James Orengo) who stated on their Assembly floor so that it is documented that Obama was a son of their soil. He apparently did not know of that and asked me to send him the documentation. Shouldn’t THIS be a good reason to start investigating Obama’s BIRTH Certificate issue? The issue is that the person who starts talking about it, won’t have all the answers and that will make them a target for “disappearing” tricks. Like some others have recently been. NAIROBI, Kenya (AP) — What do President Barack Obama, International Criminal Court Prosecutor Luis Moreno-Ocampo and Kenyan Prime Minister Raila Odinga have in common? It’s the “O” factor. Obama, Ocampo, Odinga — they all share the distinctive first letter of members of the Luo tribe in Kenya, and some in this East African nation believe that the three are brothers in a conspiracy to see six suspects convicted at Ocampo’s Hague-based court so that Odinga can become president in the land where Obama’s father was born. Though the conspiracy is fanciful, it has traction among those who believe the ICC suspects, who are charged with orchestrating Kenya’s 2007-08 postelection violence, are being unfairly prosecuted. Analysts warn that if such stereotypes are allowed to gain momentum, the chances of tribe-on-tribe violence rises. Many supporters of Deputy Prime Minister Uhuru Kenyatta and former Education Minister William Ruto, two of the ICC suspects, believe the rumor. “Obama’s father was a Luo and he (President Obama) wants his fellow tribesman Odinga to become president, so he has bribed Ocampo to prosecute Kenyatta so that Odinga can lead,” Susan Njoki, a 45-year-old food seller, told The Associated Press during a rally convened on Monday by Kenya and Ruto. Njoki also spoke at the rally that the two men held after returning from a preliminary hearing at The Hague. Even some of the more educated believe it. Observers warn that the “O” conspiracy is an example of tribal stereotypes propagated by Kenyan politicians trying to gain support from members of their tribe against opponents ahead of 2012 elections. If left unchecked, such stereotypes could lead to a repeat of the postelection violence, which killed more than 1,000 people. On their return from The Hague, Kenyatta’s and Ruto’s convoy was stoned. Odinga supporters were blamed for doing the stoning. Harun Ndubi, a human rights lawyer, said the alleged conspiracy is a “scheme” to affect the upcoming election. John Githongo, a former adviser to President Mwai Kibaki on ethics and governance, said that in the 2007 elections politicians used stereotypes to whip up hatred against Kenyatta’s Kikuyu community, and now it is being done against Odinga and his Luo community. Though Odinga and Obama’s father are both Luo, Ocampo is Argentinian — not Luo. Kenya has long been divided along tribal lines. Tribal associations influence such life choices as friends, spouses, employment and who to vote for. A recent survey by a government commission mandated to unify Kenyans found that two of Kenya’s 42 tribes held 40 percent of government jobs. In late 2007 Kenya was plunged into violence shortly after Kibaki was declared the winner of an election that Odinga supporters said was rigged. At least 600,000 people were forced from their homes. Former U.N. Secretary-General Kofi Annan negotiated a peace deal where Kibaki was named president and Odinga prime minister. Kenyatta and Ruto, once political enemies, are hinting at forming a political alliance with Vice President Kalonzo Musyoka against Odinga. Ruto fell out with Odinga after the prime minister supported bringing those responsible for the postelection violence to justice. Opinion polls in Kenya have shown Odinga as the most popular presidential candidate with Kenyatta a distant second, Musyoka third and Ruto fourth. At rallies before last week’s court hearing at The Hague, Ruto and Kenyatta attacked Odinga and painted the ICC as a tool of the West to control Kenya. No Title of Nobility shall be granted by the United States: And no Person holding any Office of Profit or Trust under them, shall, without the Consent of the Congress, accept of any present,Emolument, Office, or Title, of any kind whatever, from any King, Prince or foreign State. Obama is illegally sitting as head of the UN (not US– UN) Security Council. * to recommend to the General Assembly the appointment of the Secretary-General and, together with the Assembly, to elect the Judges of the International Court of Justice. One might say that the UN is not a STATE. Well, then the US can be viewed similarly as the UN, because we are a bunch of states that come together under the Constitution. The UN has a similar charter that the Nations that are part of it also adhere to. This however, is a title that is ABSOLUTELY illegal for a US PRESIDENT TO HOLD. US security policy in North Africa and the Middle East faces a dramatic test: will we be able to weave a strong tapestry of help for our allies and take down our enemies or will a new stronger coalition or “Axis of Jihad” banner arise from Iran to Tunisia? This coalition is now intent upon establishing its hegemonic control over the Islamic world, including a significant portion of the oil and gas resources of the world, from which to finance a war against the West and most particularly against the United States. 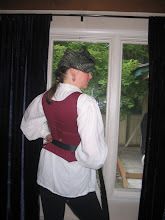 It has been a war off and on for fourteen centuries. This one is different, however. It involves nuclear weapons and ballistic missiles and has the financial clout of sovereign funds primarily supported by petro-dollars, but also infused with cash from widespread criminal enterprises including piracy and drug trafficking. Of immediate attention is our campaign in Libya, to the extent we know what it is, although as Judith Miller explains, events in Egypt are of far more importance. According to the US chairman of the House Armed Services Committee, there appears to be two missions in Libya: (1) a military mission run by NATO in which the US is a key participant to protect the civilians of the country from Qadhafi and (2) a political mission we hope as a result of these moves results in the removal of the Qadhafi regime from Tripoli either voluntarily or by force. The military missions of establishing no fly zones have had mixed success. We also do not fully know the opposition we are helping and arming. From the air alone, said the chairman, it would be most difficult to achieve the latter political objective. Even though he sympathizes with Senator Graham’s call for taking out Qadhafi now and “moving on”, ruling out “boots on the ground” makes achieving such an objective ever more remote. The chairman understands that a key objective of the administration was to protect civilians. He also explained that a key part of this was again according to administration briefings “How the rest of the world would look at us if we did not protect the civilians”. Expanding on this idea was David Sanger of the New York Times who wrote that the actions of the US in and over Libya—as well as throughout North Africa and the Middle East—have been designed to focus on the key objective of stopping the nuclear weapons program of the Mullahs in Iran. Another story tells us that a “senior New York Police Department intelligence analyst pointed to at least one short-term benefit of the upheavals: Home-grown Islamic radicals in America, too, had been stunned and shaken by the protests and the loss of what he called their ‘narrative of oppression’”. One fact of the “revolt in the desert” which started in Tunisia and has spread to Iran, Syria and Yemen, is the virtual absence of protests against either the United States or Israel. No trampling of our flag or the burning of our political leaders in effigy. In one rebel held Libyan city one soldier waved a huge American flag. No call for Jews and Christians alike to be killed. As National Review’s Rich Lowry explained in “The Death of an Illusion”: “In the great Middle East whodunit, the verdict is in: The Jews are innocent. They aren’t responsible for the violence, extremism, backwardness, discontent, or predatory government of their Arab neighbors”. In fact, the universe of revolt and protest has been a call for both economic freedom and opportunity <for sharia finance> for the hundreds of millions who are unemployed and shacked to economic failure in country after country in the Arab and Islamic world. And for the political freedom needed to achieve such dreams. One would hope therefore that this character of the revolt would finally drive a stake through the “grievance theory of terrorism” which has too often been at the heart of American security policy, especially among our intelligence community and its friends in the media, Hollywood and academia. For example, former President William Clinton said only a few weeks ago that granting the Palestinians a homeland would end most terrorism directed at the United States. Former President Carter has said much the same thing. Contrary to their assertions, the terrorism we face is primarily state-directed. It is not grievance directed. It is nothing more in large part than simple war and revenge directed against us but by means often difficult to attribute. Thus the outcome of the desert revolts is not without consequence. The bad guys should not gain ground. In particular, the current Iranian regime constitutes a threat because of its very identity as a jihadist state – the nukes, other WMD, especially biological weapons, its state directed terrorism, the massive human rights abuses–these are merely the manifestations to be expected of a jihadist state. And Iran is but a leading part of a coalition of terror states and their terror group affiliates. Tehran provides weapons, financing and training for thugs in both Iraq and Afghanistan who kill Americans and our allies. Hezbollah and Hamas are wholly owned subsidiaries of the Mullahs, as they seek to complete the plan to turn Lebanon into a proxy of Iranian terror. Iran also allies itself with Chavez in Venezuela who in turn works with the drug cartel and terror group FARC and Hezbollah to plan terror attacks against Columbia, Mexico and the United States. An Iranian Shahab launched from off-shore Venezuela can hit down-town Miami. North Korea, China and Russia help provide missile and nuclear technology to Iran. The attorney for the city of New York indicted one Chinese company on 104 counts of helping Iran with such technologies. Is the drive-by media in this country asleep? Similarly, rocket engines from the BM-25, a missile originally produced by Russia, made their way from Pyongyang to Tehran. This gives Iran a missile with a range near 4000 kilometers which puts all of Europe under its shadow, says Uzi Rubin of Israel. In Libya, the areas controlled by the rebels have become an arms bazaar for Al Qaeda in North Africa. According to Jonathan Shanzer of the Washington Institute, Al-Qaeda of the Islamic Maghreb (AQIM) is reportedly amassing surface-to-air missiles, anti-tank weapons, rocket-propelled grenades, explosives, heavy machine-guns and other small arms and smuggling them to lawless areas in Mali. Some of our allies are not helping either. Recently, Senators Kyl and Lieberman and Congressman Berman, all expressed serious concern over our failure to take seriously the Iranian threat. It is not only that this administration (and its two successors) was not utilizing the sanctions power it has under legislation passed by Congress (originally passed in 1996 but since strengthened). It was that a German located bank—the European-Iranian Trade Bank AG—had become a major conduit for Iranian companies involved in weapons proliferation. This brings us back to Libya. According to recent reports, “During the weekend, Qadhafi forces sustained pressure on Misrata and drove the rebels from Ajdabiya, for a time. Timely NATO air attacks disrupted the attack on Ajdabiya and rebel fighters reportedly pushed Qadhafi forces out of Ajdabiya. At last report rebels still hold Misrata and Ajdabiya. While the African Union has said Gadaffi has accepted their proposed cease fire, the former is but a wholly-owned subsidiary of the latter. Such a cease fire is a sham. We have to understand Gadaffi was and could again become a key state sponsor of terrorism. Note that only when Saddam was pulled from his spider hole in 2004 did Libya give up its nuclear weapons program and its other weapons of mass destruction efforts. The moral of this story? The ability of the US to project and exercise force is important. Maybe we could call it “smart power”! As former Senator Wallop once noted, “Diplomacy without the threat of force is simply prayer”. For too many, however, US force when used is considered largely illegitimate. “Experts” such as Lawrence Wright in his “Looming Tower” associated the attacks of 9/11 with Al Qaeda grievances, especially about US military forces “in the land of the shrines”, (otherwise known as the Kingdom of Saudi Arabia). But what is never commented on were the other grievances by Osama Bin Laden—that the US had kicked Saddam out of Kuwait; that we maintained “no-fly zones” over Iraq; that we had established sanctions against Baghdad; and that our restrictions on the sale of oil had supposedly resulted in millions of Iraqi children failing to get “health care”. Sound familiar? Few if any analysts have explained Osama coming to the defense of Saddam! Given the strong Iraqi connection to the 1993 World Trade Center bombing, (occurring as it did precisely on the second anniversary of Saddam’s surrender in Gulf War 1991), one would have thought someone would ask a simple question: who are these people working for and is it possible such terror organizations can be used by state intelligence services for their own ends? And as such, how convenient the “narrative of oppression” is for states such as Iran, Iraq, Syria Libya and others to hide their terrorist means and their empire ends! We know from numerous pleas from the Iraq government to the US government that Syria has not stopped providing sanctuary for the “rat lines” into Iraq. Thousands of recruits traveling from the mosques and madrassas of Northern Africa fly to Damascus and from there enter Iraq and carry out attacks against US and Iraqi and coalition soldiers, police and civilians, including working with Saddam’s trained terror masters in widespread torture and bombings. Did we really do the right thing to help oust Mubarak, simply because the youth and professionals and shop keepers of Cairo “have grievances”? As Judith Miller explains, “Cairo has been a staunch ally in America’s Arab-supported campaign to contain Iranian influence in the region and prevent Tehran from developing atomic bombs. But Syria, a bona fide member of the Axis of Jihad, somehow gets the good housekeeping seal of “reform approval” by our US Department of State, leaving Syria as a place for terrorist hiding, where they can recruit, train and organize terrorists. That we too often refer to Syria as a potential “peace partner”– when all Damascus does is facilitate a war of terror against its enemies—certainly makes the American people perplexed. The “Axis of Jihad” is on the march, just as the Soviets and their terror master friends were in the late 1970s. The liberation of Iraq and Afghanistan were designed to take down two “terror masters”, which we successfully did. Unless we finish the job, as well as pay attention to the new jobs at hand, we could hand our enemies more real estate (and more oil) from which to plan, train, and finance, operate and recruit their armies of jihadis intent upon our destruction. State sponsors of terrorism are alive and well. US policy should not be in the business of adding to their ranks. FamilySecurityMatters.org Contributing Editor Peter Huessy is on the Board of the Maryland Taxpayers Association and is President of Geostrategic Analysis of Potomac, Maryland, a national security firm. Government schools are the reason why this is going on. I was a product of the better times. Now, there are no better times. Those schools are extreme. They harbor criminals. They educate children into crime. I was beat up and almost didn’t make it. Eventually, I joined the military. I got out. I would never go back. Not to that place. Not to the boroughs of NEW YORK. Never. Manhattan is nice to visit, because it’s a tourist place. Don’t bother with the rest. It’s a dump. UPPER EAST SIDE — The parents of waitlisted 5-year-olds on the Upper East Side have another 13 years to worry about getting their kids into college, but they’re already getting a lesson in anxiety. Eighty-five children are waitlisted for P.S. 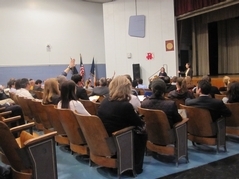 59, on East 63rd Street between Second and Third Avenues, the latest Department of Education numbers showed. At P.S. 290, on East 82nd Street between First and Second Avenues, 65 kids are on the waitlist. 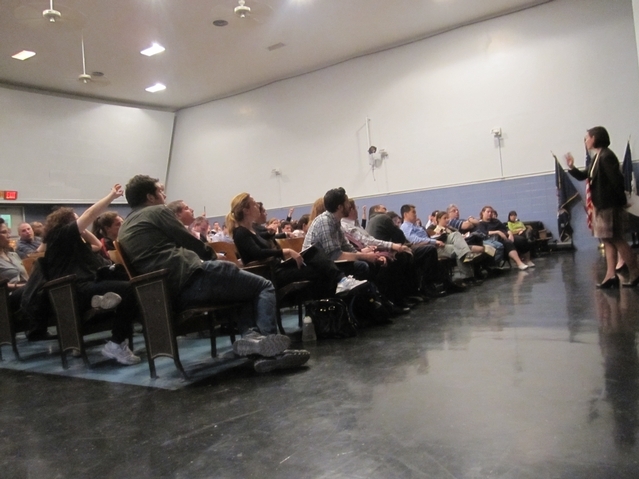 Adding to the angst, the waitlist numbers are changing daily, DOE officials told a room of tense Upper East Side parents on Monday night. The lists change as children were admitted to private schools, education officials said, and they would continue to fluctuate until June when families will hear whether their kids get into gifted and talented programs. That figure instead evoked grumbles and sighs. “You hope people are going to leave and go to the suburbs or go to private school?” one man yelled out in despair. “We have tracked the numbers of students who go to [gifted and talented programs],” Rose responded. “Based on that history, we are confident we will place all the students in District 2,” she said of this Manhattan school district that stretches to Lower Manhattan. Parents would get offers to send their kindergartners to alternatives to their first choice schools some time in May, Rose said. Students will be assigned to other schools based on geographic proximity. Some of the kids in P.S. 59’s zone, she explained, might go to schools south of 63rd Street, while four schools north of it — P.S. 151, 158, 198 and 267 — would pick up others. Upper East Side schools were rezoned just a few months ago to alleviate overcrowding, but DOE officials warned then that changing zones would not eliminate kindergarten waitlists — especially in the case of P.S. 290, where blocks initially taken out of the zone were eventually added back. But before sending out letters about these alternative schools, education officials were considering adding one more section of kindergarten at one of three schools that might have room — P.S. 151, 158 and 267 — Rose said. Parents wanted to know why they couldn’t have a say in the process to let the DOE know their second or third choices. One parent, whose son is waitlisted at P.S. 59, told DNAinfo she would prefer to go south since she has to take her daughter to daycare downtown. “The fair way to do this, to be as close as possible, is based on geography,” she said. Parents could apply for a special exemption if they have a hardship, she told parents. Rose also told parents that their children would be eligible for a bus ride, if given a school more than half a mile from where they lived. But that only stoked more questions. Parents asked how many adults would supervise the kids on the bus. They wanted to know if the bus driver would drop off a 5-year-old if the parent, for some reason, wasn’t at the bus stop in the afternoon. A mother, who lives on the same block as P.S. 290, told DNAinfo how upsetting it would be to walk by there every morning with her son and explain why he can’t go there. Another parent told DNAinfo he moved around the corner from P.S. 290 when his daughter was born so she could go there. You are currently browsing the archives for the Al Sharpton category. update video of bomber -US and India knew about pending attacks and warned about them, but didn't know about Notre Dame?